Forget old way of pressing scroll button or using mouse well to scroll to top now its time to add a back to top button to your blog which let your visitors to scroll to top by just one click. This is a very popular and useful widget and every blogger must have this widget specially those bloggers and webmasters who have long post in blog or website should add this widget to blog because it makes scrolling easy and fast. It works with a jquery code, when it is add to blog and any of the blog page is scroll down it appears so when the it is clicked it will scroll you to the top of the page. See demo! How to add back to top button in blogger? 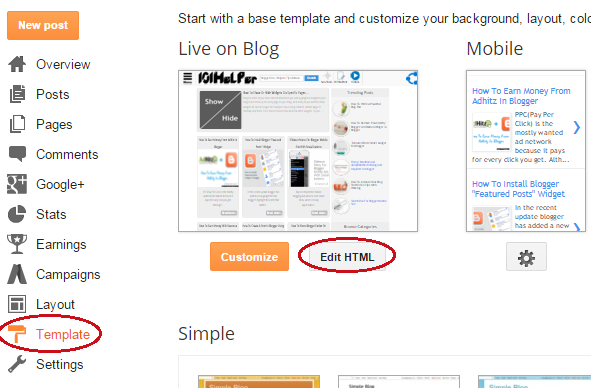 Step 2: Open template and click on Edit Html . Step 3: Search for <head> or </head> you will find this in the top area of the code. Step 4: Copy below code and paste it below <head> or above </head> in your template. If you like this post then do me a favor recommend this post on Google by clicking g+1 below, if you are having any problem in adding this gadget or this gadget isn't working ask me in comments. Follow and subscribe by E-mail to get latest news about blogger gadgets in your inbox. Search Tags: back to top button, scroll to top button, blogger gadgets, How to add stylish back to top button in blogger,back to top jquery,back to top html,back to top jquery plugin.